Succession Planning: Is Your Organization Prepared? With 10,000 Baby Boomers reaching retirement age each day from 2011 until 2030, organizations will spend at least the next decade facing a looming threat of departing talent. Additionally, as a study of federal employees found that nearly two-thirds of retirement-eligible federal government employees did not help train a new employee to replace them before they retired, there is great concern that not enough organizations have a plan in place for ensuring sufficient knowledge transfer in the wake of departing employees. In other words, not enough organizations have a succession planning process. 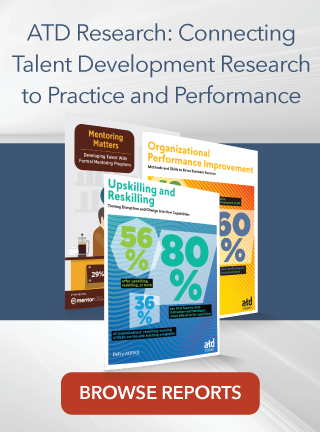 ATD’s research report Succession Planning: Ensuring Continued Excellence confirms this. The report found that just 35 percent of organizations have a formalized succession planning process. The report defines succession planning as the process organizations use to identify the key positions, candidates, and employees needed to meet short- and long-term challenges, as well as the process of developing and advancing selected employees in the succession pipeline. Fifty-three percent of organizations, meanwhile, did not have a formal succession planning process in place. According to the report, the top reason for adopting a formal succession planning process, cited by 89 percent of respondents whose organizations use succession planning, is to identify and prepare future leaders. Other top reasons are creating opportunities for internal advancement (72 percent) and ensuring business continuity (also 72 percent). When ATD last conducted research on this topic in 2010, it found that just 14 percent of respondents thought their organization’s succession planning process was highly effective. In 2018, Succession Planning reports that 34 percent of respondents said their organization’s succession planning process was effective to a high or very high extent. While it is good news that a higher percentage of organizations have an effective succession planning process, there remains a great need for more organizations to implement formal succession planning processes of their own. Among organizations with no formal succession planning process, nearly half (47 percent) have plans to create one. Talent development professionals interested in improving or beginning a succession planning process in their organization should consider the methods they use to develop candidates. Mentoring and coaching is the most popular method organizations use to develop succession candidates—83 percent of organizations use this practice. Nearly three-quarters (72 percent) of organizations use formal learning to develop succession candidates, and nearly as many (70 percent) use stretch assignments, which are assignments beyond the employee’s current skill level. Succession Planning found that these three methods were significantly linked to succession planning effectiveness. Succession Planning also recommends that organizations measure the results of their succession planning efforts. The report found that organizations that measured these results (through metrics such as the number of positions filled by succession candidates, the number of candidates in the succession pipeline, or retention rates of succession candidates) had significantly higher succession planning effectiveness scores than organizations that did not use these methods. The full Succession Planning report is available for purchase at www.td.org/succession. ATD members can visit that same link to download the whitepaper for free. ATD also has some member-only 10-Minute Case Studies about succession planning processes organizations have implemented. Freese and Nichols: Establishing a Pipeline of C-Suite Talent describes how an organization developed a succession planning process to fill positions caused by the impending retirements of the company’s CEO and chief operating officer. Another case study, Haworth: Developing Aspiring Leaders, describes how a company developed a leadership development program to maintain its goal of filling at least 70 percent of its open positions with internal candidates. ATD members can read these and other 10-Minute Case Studies for free.